Wayne Messmer has gained most of his fame because of his fantastic voice. Messmer has sung the National Anthem for the Chicago Blackhawks, the Chicago Wolves, the Chicago Cubs, the Chicago White Sox, the Chicago Sting, the St. Louis Blues and probably countless other organizations. Once you hear Messmer sing it, you've heard the best! Messmer overcame a horrible life-threatening incident in which he was shot in the throat. Fortunately, Messmer not only survived, he lived to sing again. 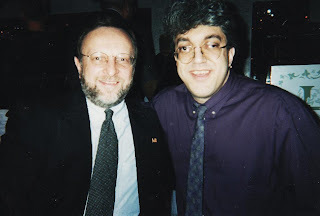 I had the pleasure of meeting Messmer at a political fundraiser a few years back. Messmer's voice is just as rich in person in regular conversation. He was very happy to talk about anything, from politics to the current state of any Chicago sports team. I think Messmer has a lot of great stories that need telling. I think a book is in Messmer's future. If that happens, you'll read about it here. Wayne Messmer and me in River Grove, IL-early 00's.